The former president also advised the opposition Peoples Democratic Party to purge itself of “bad eggs and hypocrites”, who according to him, lack the commitment and goodwill to return the opposition party to its lost glory. 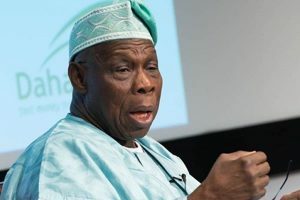 Obasanjo spoke when South-West PDP leaders led by the party’s National Vice Chairman (South West), Dr Eddy Olafeso visited him at his Pent-House residence inside Olusegun Obasanjo Presidential Library (OOPL), Oke-Mosan, Abeokuta, Ogun State. According to him, Nigeria demands a vibrant voice and opposition in PDP with a view to building a virile democracy. The former President who pointed out that many leaders of the party are after “their pockets and stomach”, wondered why some top echelon have left the party while others had lost hope shortly after the results of 2019 Presidential election was announced. “I said if you compare the two of them (referring to Atiku and Buhari); with what I know and all I have written about the incumbent (President) which they have decided to cover up, Atiku is better than the incumbent by far. That’s the point I am making. And nobody is perfect. “I am not a perfect person. I have my shortcomings. If I deny my shortcomings, it means I am not being truthful to myself. But, my shortcomings has nothing to do with my love for Nigeria. It has nothing to do with being greedy or selfishness,” Obasanjo said.